Tulips, orchids and roses are flowers that people have enjoyed through history, and at times, interest in these flowers has bordered on obsession, said Amy Pickard, rare books librarian at the Buffalo and Erie County Public Library. 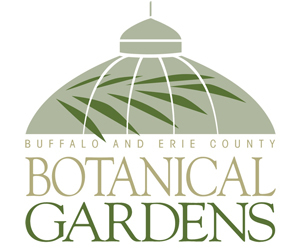 She put together the exhibit “In the Garden: The Art of Botanical Illustration” in the Rare Book Room of the Central Library, 1 Lafayette Square, Buffalo. It is open during regular library hours and can be seen through Sept. 26. “A lot of people are aware of the significance of roses in our culture, and now orchids are very collectible, but people may not know that at one time tulips were the object of obsession,” she said. Holland went through Tulip Mania in the 1630s. As tulips became increasingly popular, prices went up. People started speculating in the tulip market, gambling their homes and entire fortunes. When the economic bubble burst, many people were stuck with tulip bulbs that were worth only a tiny fraction of what they had paid. The tulip above left is Tulipa alberti from Curtis’ Botanical Magazine, which began in 1787. Although orchids appear in some 15th-century herbal books, fascination with orchids peaked during the Victorian era in England. There were several reasons for that, including the introduction of heated glass greenhouses to sustain tropical plants. Orchid collecting spread to the United States as a hobby for the wealthy. 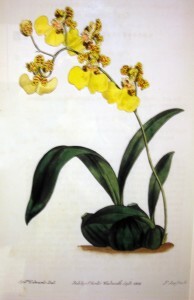 In 1902, the collection of Mrs. George B. Wilson of Philadelphia was valued at $300,000, and one of the rarer orchids in the collection was worth $10,000. Today, the orchid industry does about $128 million in wholesale business annually. The orchid above right is Oncidium Bifolium, which is a two-leaved Oncidium. 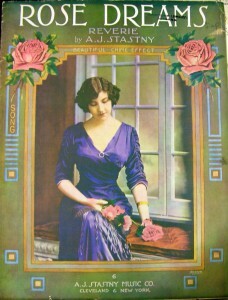 It is also from Curtis’ Botanical Magazine. The rose is called “the world’s favorite flower.” It is believed that roses were first cultivated more than 5,000 years ago in Chinese gardens. The beauty and fragrance of roses have been been part of art and literature ever since. The rose has symbolized love, beauty, Christ, the Virgin Mary, confidentiality, nationality and heraldry. In the 17th century, roses were in such high demand that royalty used roses and rose water as legal tender to purchase other items or to pay debts. The rose above is Royal Virgin Without Thorns, in an illustration by Georg Dionysius Ehret from the 1700s. 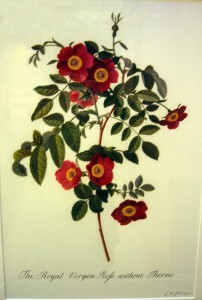 The exhibit takes a chronological approach to botanical illustration. It notes that the images of plants in early botanical books were created not to be decorative, but to help people identify plants and learn their medicinal, and occasionally culinary, uses. They pictured the entire plant, root and all. 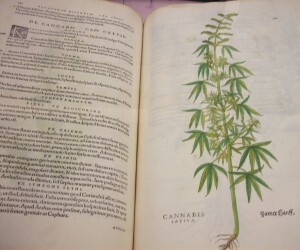 At right is a 1542 picture of cannabis, which we know more commonly as marijuana. “I chose this plate because it’s a plant in just about every herbal” book, Pickard said. It was seen as a medicinal plant, much as we would view aloe today. Pickard said she had shown the book to a group of medical professionals, and one translated the Latin text accompanying the illustration. The plant, it said, was supposed to aid in digestion and reduce flatulence. Today, some doctors prescribe marijuana to reduce nausea and vomiting, especially associated with chemotherapy treatments for cancer. The book pictured is by Leonhart Fuchs, known as one of the three German fathers of botany. The fuchsia flower is named for him. Hieronymus Bock, another of the fathers of botany, brought the field into modern times by basing it on scientific observation and meticulous description. The third father of botany was Otto Brunfels. A plant genus, Brunfelsia (Solanaceae) was named for him. While the exhibit helps us learn about how people in earlier centuries viewed and valued plants, simply looking at the beautiful illustrations is enjoyable for gardeners. While you’re at the Rare Books Room, stop next door to see the exhibit outside the music department called “Songs in Bloom.” You’ll see sheet music with a gardening theme. 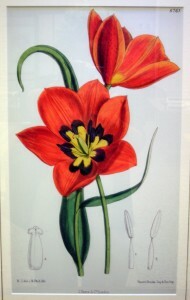 In keeping with the gardening theme, you can buy botanical prints and other merchandise in the library’s shop.